Hi everyone. 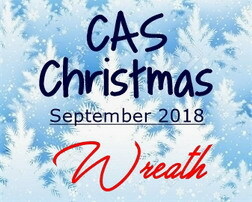 Time for the reminder for CAS Christmas Challenge. This month is being hosted by the very talented Nance. She wants us to include a wreath on our CAS Christmas cards. I got this small holly die from Impression Obsession a while ago and it's been waiting patiently for me to use it (NBUS again Dolly!!). Check out the reminder post on the challenge blog to see the new, beautiful wreath cards from our Designers and Guest Designer, Birgit. Then come join us. We'd love to see you in the gallery!! There's still a week left to play! Such a pretty wreath, Loll! I love the patterned papers and your clever idea to create your wreath with a holly die! Great idea to use your hole punch for the berries, too! A beautiful wreath, Loll! The holly leaves are a perfect size for a wreath and I love the addition of the red berries! Nothing else is needed. Perfect as is! I've never seen that wonderful holly leaf die with the stitches before but it sure makes up into a beautiful wreath! Love the added berries on this. Quick? Not here it wouldn't be (grin) but sure do love the outcome! Love the stitched leaves - the stitching adds lots of texture and interest. Great choice of dp for getting variegation in colour. Love the red berries matching the red of the sentiment perfectly. really lovely, has a great 'country Christmas' feel to it. Sweet Loll!! I really need to CASE this sweet card! I have an OLD die cut from Quickutz that would work nicely. Thanks for the inspiration!! I think I am even going to be able to join your challenge!! woo hoo I'm happy to be back! So pretty and so cute. Great patience with those holly leaves and such a fabulous wreath card x. That green is such a pretty color for your wreath. I love the dimension and those teeny little berries. This is so clean and crisp. Love your little holly leaves that you made into a wreath. Very pretty Loll. Love your red sentiment. Hugs and hope you are having a great week. gorgeous DP for your holly leaves LOll and love those berries scattered around. Holly wreath looks great. The use of colored paper is a great solution. Your ideas are always perfect and the cards are so elegant. What a great way to create a cute wreath, Loll.